"An intimate look into the workings of a truly magnificent partnership"
"An exploration of the human capacity for generous and mature love"
"A description of the actual behaviors one person can take to make that love a reality"
In this unique inquiry into the deepest incarnation of love, author Richard Matzkin has looked to his extraordinary, three decade long marriage to Alice as a living laboratory to research the elements that comprise a truly loving, magnificent partnership. 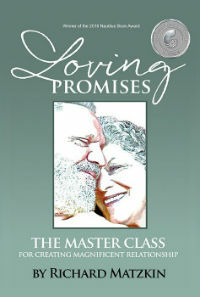 He has discovered 39 Loving Promises – statements of intention you pledge to yourself, not to your partner – that are the behavioral components of a deep, abiding love. These Promises are a profound path to transform even a good relationship into a magnificent one. In addition to the usual vows lovers make to each other – vows of commitment, honesty, acceptance, unselfishness and fidelity – the Promises include more obscure, but no less important ones such as: I Will Regard You As My Equal, I Will Participate In Your Life, I Will Challenge You When Necessary, I Will Not Manipulate You, I Will Protect Our Confidentiality, I Will Honor Your Family, I Will Respect Our Independence. Each one of these pledges are an essential aspect of a loving relationship. "Immensely practical. I cannot imagine a book that holds more potential to improve relationships. Just reflect on one of these Promises a day and the sky is the limit."